I am writing this post today because Kyle is letting me write it. It's an honor, because Kyle doesn't let me do a lot these days without his permission. Since seizing control of our apartment a little more than a week ago, he has ruled with an iron fist. Every day - and more disturbingly, every night - this is the Kyle we must obey. Jennifer and I are at his mercy, and he knows it. Every cry has become louder, as Kyle faces every problem - major (diaper) or minor (diaper) - as if he is heralding the end of the world. As you may imagine, this is making Jennifer and I very very very very very very very very very very very very very very tiiiiiiiiiiiiiiiiiiiiiiiiirrrrrrrrrrreeeeed. In fact, Jennifer is trying to get some sleep as I write this (again, because King Kyle is granting her permission). There were warning signs, of course. In the days after his birth, Kyle managed to keep both his Mom and Dad very busy at the hospital. The fatigue engulfed us, and by the end of the stay we were not able to think straight, and we kept losing stuff. In fact, one morning on my way to the hospital (they didn't let me stay overnight for my own safety), I left my apartment with a bottle of water in my hand. I got halfway to the subway stop and realized that a) I was no longer carrying the bottle, and b) I had no idea what I did with it. I was rather embarrassed by that. It wasn't until I got to the subway that I realized I also wasn't wearing any pants. ... don't mess with King Kyle. Okay - I gotta go now. I think I hear a dirty diaper. Any day now. 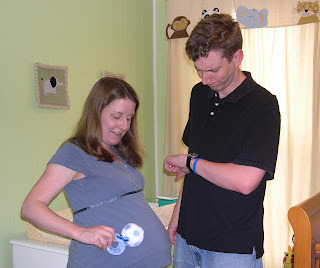 Yes, we're still a week away from the due date, but we're getting a little impatient. The little one has grown considerably, and frankly that hasn't been too comfortable for Jennifer. As for me, all my shows are now in summer reruns, and I'm just anxious to do something else. So, we're trying everything we can think of to get him to come out. We talk to him about the beauties of being outside, and how he'll have so much room to move about. We go on and on about the walks we'll take him on and the playgrounds we'll visit. Like any good salesperson, we occasionally have to stretch the truth about the outside, and say things like "we'll teach you how to FLY!" But even that doesn't seem to be working... the little one just stirs in the womb, showing us that he's very comfortable in there. Our final option has been bribery. As of now, if Kyle decides to come out in the next couple of days, he'll get extra desserts for a week when he's seven years old. He will also be awarded a trip to Disney World, and he'll be allowed to name his younger sister or brother. We might even throw in a car. Granted, if he goes beyond the due date, those prizes disappear, and we'll start taking away things. If we don't celebrate his ninth birthday, this will be the reason why. So I'm asking all of you to think about Kyle being born, and maybe your collective thoughts will make it happen. But, please, don't think of Jennifer going into labor during rush hour traffic, or in the middle of the NBA finals, and certainly not when we're just about to go to bed. Let's think 10 am, after a good night's sleep. 10 am this Thursday. Does that sound good to you? It certainly sounds good to us. Gooooooo, Kyle!